Seek to involve your employees as much as possible in promoting your brand. Let your employees talk and market using Google+, and feature them more than you do the brand image itself. Make them a reflection of the brand; Disney calls all its employees “cast members.” You’ll notice that even a big company like Google does this by letting their employees be the ones who personally announce products on Google+. 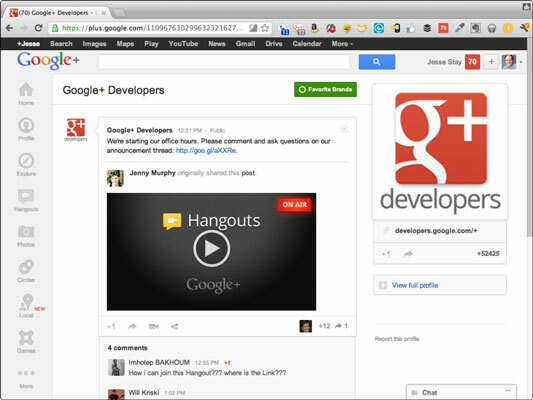 Use Google+ Hangouts to have Q&A hours. Google actually uses this approach on its own behalf, opening a weekly Hangout where developers can get in and ask questions and interact with their API team for questions. You could do the same with your customers, giving your customers an opportunity to meet real people in the company. Michael Dell, CEO of Dell Computer, Inc., does this on occasion to see what his customers think. Only 10 people at a time can join, so that provides a limit to keep you from getting overwhelmed, and you can always stream the Hangouts through Google’s Hangouts On Air. Make sure your employees have accounts on Google+. Domo, a company founded by Josh James (founder of Omniture), requires its employees to have certain social media accounts in order to be employed. Employees are given free rein to use their accounts, with the goal of familiarizing employees with social networking. You may or may not choose to do this, but a Google+ account is one of the most important accounts your employees can have to help promote the company. If you’re interested in Google search, this is the way to do it — most important, it gives your customers a chance to get to know your company’s employees. Share circles of your favorite followers. This is a great way to make your followers feel good. Reward and promote good behavior, and good behavior will occur. Share circles of your employees. You should probably have a circle or two of your employees on Google+. Maybe you separate the circles by department. This will allow those on Google+ to get to know the people behind your brand, and show that there are actually human beings working behind the scenes. Use YouTube to do regular updates of how your products are made and what your employees are doing. Video is a great way to do behind-the-scenes updates on what people are doing in your company. Robert Scoble started doing this for Microsoft in the early days of the Internet. He created a podcast and started blogging and sharing, via video, what other employees were doing to improve the products. This was over ten years ago, and people at the company thought he was crazy. However, what he did restored a lot of Microsoft’s image and made them a brand that people could associate with. Utilize Blogger.com to post longer-form text updates about your company as well as new products. Like video, a blog can be a highly effective way to “write the news the way you want” — and provide longer-form content for your customers, and those following your brand, to subscribe to. Hosting your own blog using tools like Blogger.com allows you to create the news.